Oh my god. These are beautiful! Can I come visit one spring? All we get to see are the *pristine* flowers newly planted in their beds, and they aren’t so vibrant even. If I come a warning: my husband’s Scottish… Is that ok?? I’m personally a good bit Scots myself 🙂 Never any bad blood between the Irish and the Scottish that I’m aware of! Yep, Orange isn’t that popular here 🙂 Hubby will know why not! But I’ll warn ye, Irish gals go weak in the knees for a Scottish accent! Ha! It’s okay. I decided a while ago with this one if they want him that bad they can have him! (And retrain him!!) plus he only ever had a British accent before but with all his moving around he has a generic N. American accent now. I’ll swoon with the Irish girls over the Scottish accents! It sure is a strong one isn’t it? It’s beautiful too! I’m very impressed! Done nothing to keep them going for years now. 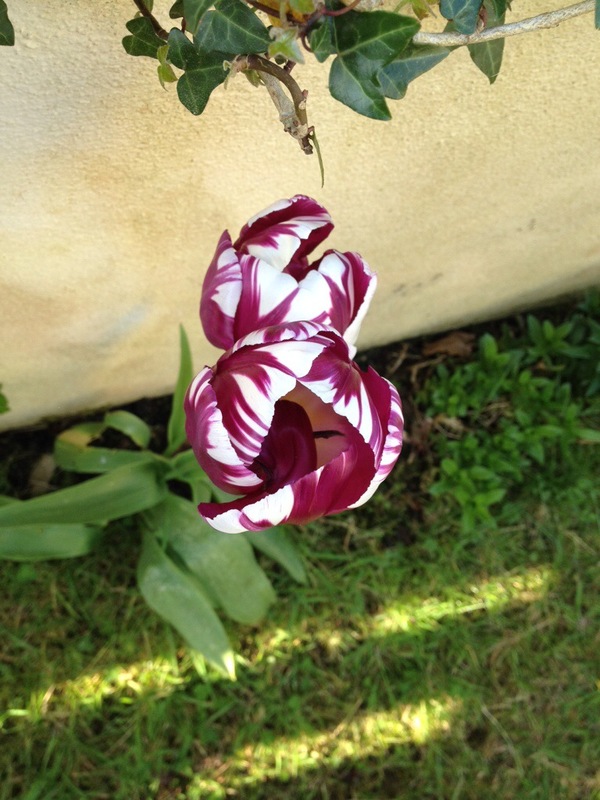 Cool picture – what unusual coloring for tulips – we usually just see the basic one colored ones. I’ll send you some rain – if the pattern changes and I can send to the west! I had purple, white, and these purple and white ones. The white all died fast, but I still have some of the solid purple and these last two variegated ones. I hear that the multicolored ones are infected with some sort of virus like Tobacco Mosaic which produces the piebaldness. Creative microorganisms! Ooo, I’ll have to look into that! Thank you! I didn’t muck about with this, not even cropping.